Paul Malone of Peterborough Sports shoots over the bar against Didcot Town. Photo: James Richardson. Matt Sparrow was the star as Yaxley ended a run of four straight defeats in Division One central of the Evo Stik Southern League today (September 15). Sparrow scored twice in three minutes in the first-half against Sutton Coldfield at In2itive Park to add to an early Tom Waumsley goal and the Cuckoos maintained that lead to the final whistle to earn a second win of the seasin in front of a crowd of 63. Mark Jones of Peterborough Sports saw this effort saved by the Dicot goalkeeper. Photo: James Richardson. Peterborough Sports attracted 167 for their game against Didcot Town at the Bee Arena, but most would have left disappointed with a goalless draw which knocked the city side off the top of the table. Sports had won their previous four league games, but couldn’t find a way past a resolute defence to make it a perfect five. Sports are now third. Pride of place locally in Division One East of the Northern League went to Wisbech who registered their first home win of the campaign in style. The Fenmen trailed 1-0 at half-time to Markse, who topped the table at the start of the day, but scored three times in nine second-half minutes through Sam Gaughran, Ryan Harnwell and Sam Murphy to claim an excellent three points in front of 249 fans. Josh McCammon of Peterborough Sports shoots at goal in the goalless draw with Didcot. Photo: James Richardson. 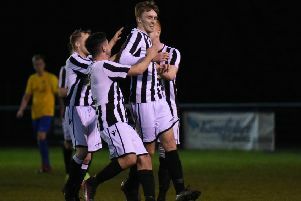 Stamford drew a crowd of 285 to the Zeeco Stadium, but they went down 2-1 at home to a strong Morpeth outfit. Sam Grouse claimed a consolation goal midway through the second half. The Daniels are down to eighth, Wisbech are 12th, while Spalding are 17th after drawing for the fifth time in six games, this time 0-0 against next-to-bottom Pickering at the Sir Halley Stewart Stadium. Spalding, who are now the only team in the division without a win, were grateful to goalkeeper Michael Duggan’s first-half penalty save. Division One East: Spalding Utd 0, Pickering Town 0; Stamford 1 (Grouse), Morpeth Town 2; Wisbech Town 3 (Gaughran, Harnwell, Murphy), Marske Utd 1. Division One Central: Peterborough Sports 0, Didcot Town 0; Yaxley 3 (Sparrow 2, Waumsley), Sutton Coldfield Town 0.